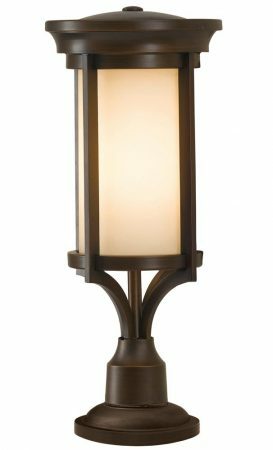 This Feiss Merrill 1 light small outdoor pedestal lantern in heritage bronze finish is rated IP44 and features Art Deco style and etched glass. Boasting circular ground mount, curved buttresses attached to a rod and upright circular lantern, with brimmed roof and outer rods jointing the two halves. The lantern is fitted with etched cream glass for a wonderful glow. This exterior light is supplied by Elstead Lighting and designed in the USA by Hinkley, founded in 1922 in Cleveland, Ohio. They have transformed from a small outdoor lantern company to a global brand intent on bringing you the best in style, quality and value designs like the Merrill 1 light small outdoor pedestal lantern in heritage bronze finish and rated IP44 featured here.